DURBUY, BELGIUM: Arguably, Durbuy is (or at least once was) known to be the smallest town in the world (or may be just Europe). Situated by River Oarthe, this village of Province de Luxembourg is a charming French-speaking part of Belgium (Wallonia) with many hidden wonders. I can visit this place over and over without getting tired. This is a naturally beautiful city in the hilly area with beautiful old town and cute buildings. The village has only 14 streets and 250 inhabitants, according to one of the locals my husband spoke to. 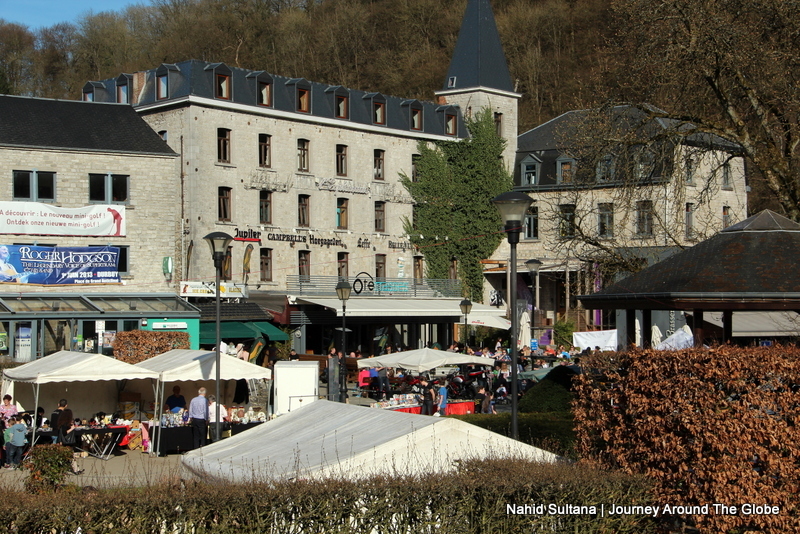 It was jam packed…I mean, seriously, heavily crowded the afternoon we visited Durbuy. We reached there after 4/5 pm and had hard time finding a parking spot or a proper parking place. I thought something was going on, but no it’s just locals, people from surrounding villages, other tourists and lots of bikers…made this tiny place a real lively spot to hangout. 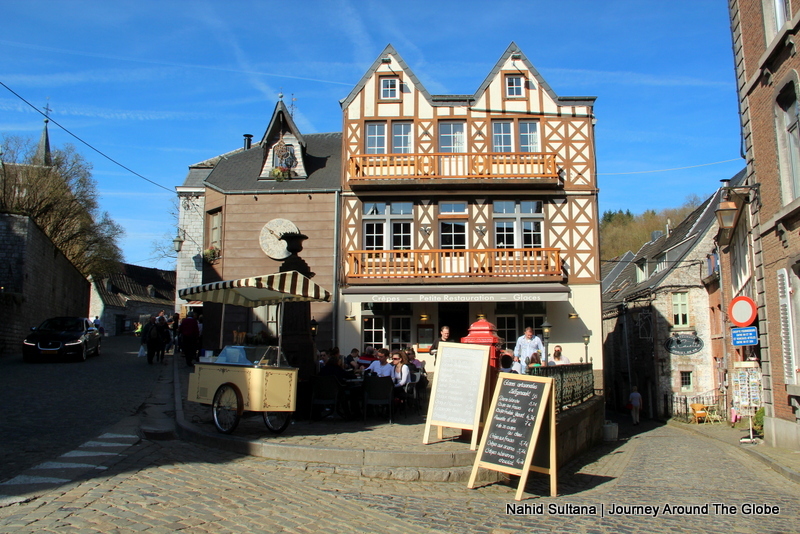 TIME of TRAVEL: It was a bright and sunny Sunday of April, 2013 when we went to Durbuy for couple hours. 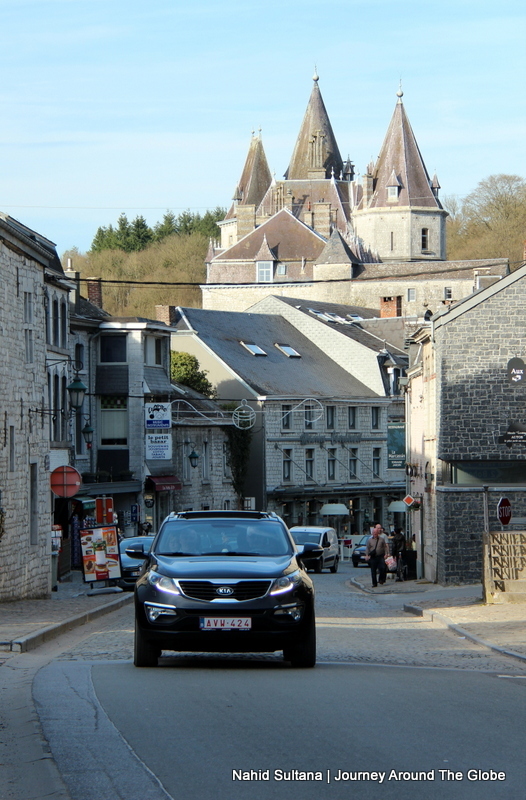 We first stopped at Dinant, then drove another 45 minutes to go to Durbuy. The day turned out to be a hot day and felt heavenly after a long and dark winter in Belgium. EATING and SHOPPING: Although this is a tiny village but no shortage of restaurants and cafes…they are everywhere. City center or the main square of the village has tons of them lining at one side. Durbuy has some nice small boutique stores at many corners of pedestrian zones. They looked so nice and cute from outside…too bad we didn’t have enough time to fulfil my heart. 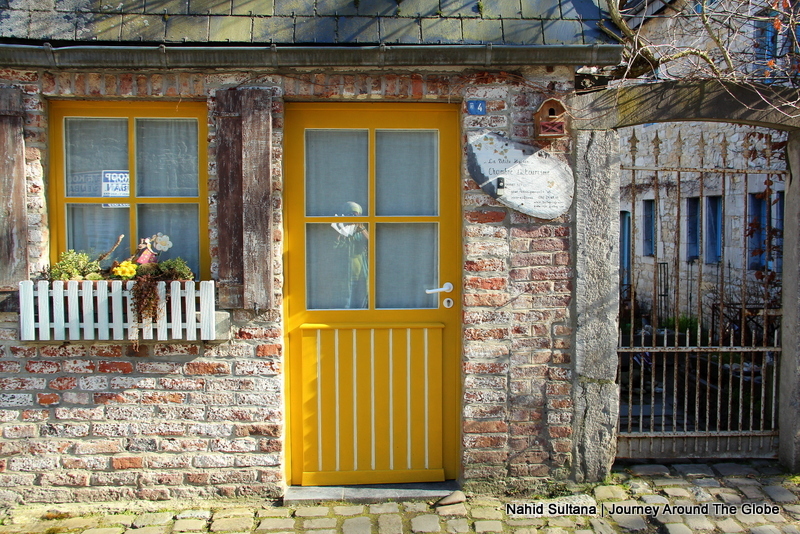 PLACES WE’VE VISITED: This is not only the smallest town in the world, but also one of the prettiest. Durbuy is a popular destination for kayaking. We saw plenty of stores renting out kayaks. Other than the following mentionable places, whole city of Durbuy is very beautiful and scenic. Roaming around small alleys of old town is pretty cool. A walk through the old town is a must for every visitor. We spent some near a small park by the river at the end of the day. 1) ST. NICHOLAS CHURCH: This is a small and simple church very close to the chateau. Interior and exterior of the church show the age of this place. You can tell it has been standing here for centuries. 2) LE CHATEAU: The castle was built around 1880 and is located at the heart of the city. Tourists are not allowed to go in but the bold architecture is definitely admirable. 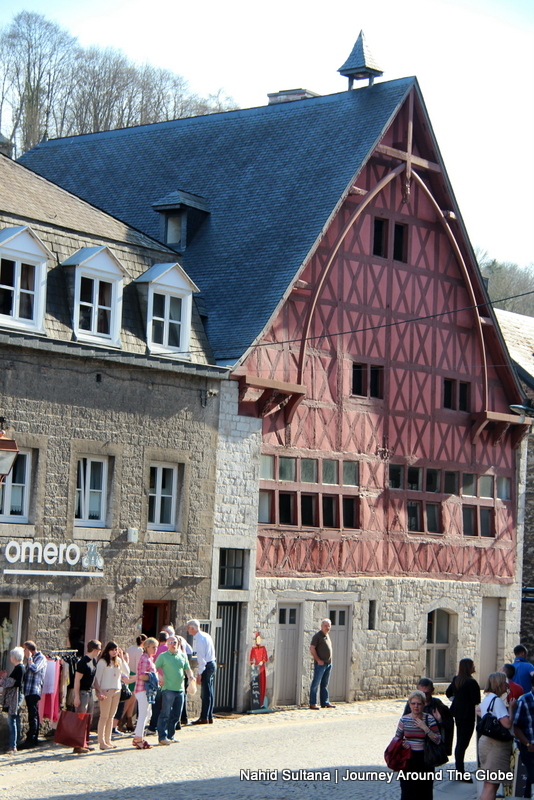 3) CITY CENTER: Located at foothill of a small hill, city center is the hot spot of Durbuy. Many restaurants and shops can be found here. They had a nice antique market here during our visit. Most of the crowd gather here for meeting, hanging out, and watch the world go by.